Kate Hunter is terrified, desperate, hanging on by her fingernails. Her adolescent daughter ran away three years ago, and finally Kate has a lead to the girl’s seclusion in a cult – even a glimmer of hope that on this day, all may end well. That’s why, in Steven Dietz’s thriller “On Clover Road,” we find Kate holed up in a dilapidated motel room with a brusque, imperious de-programmer who claims he’s experienced at reeling kids back from the abyss. 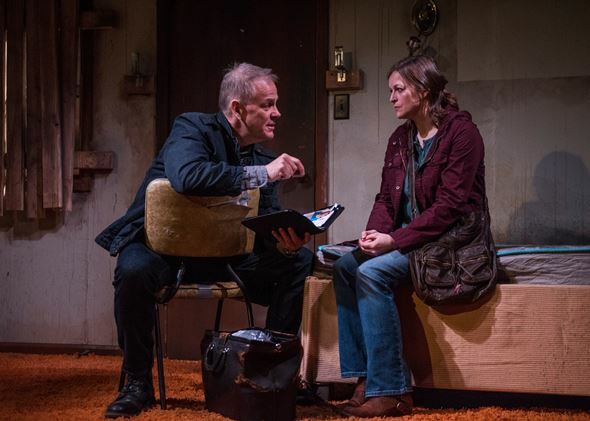 The room, this marvelous ramshackle room at the center of American Blues Theater’s heart-stopping production, speaks volumes, like one more player in a dark tale. 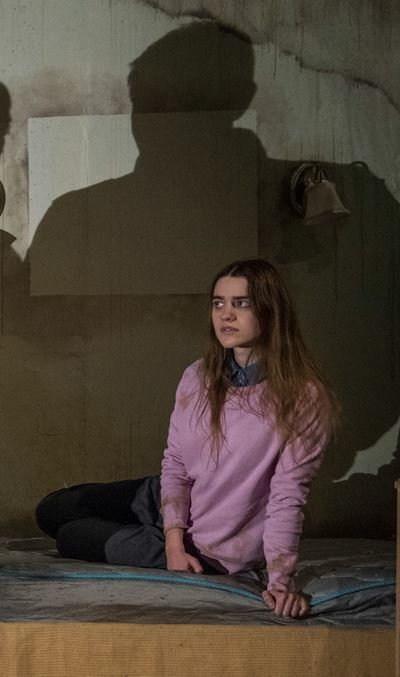 The girl (Grace Smith), perhaps Kate’s daughter, shrinks into the shadows as events unfold around her. Creepily conjured by set designer Lizzie Bracken, the room in this abandoned motel has but one amenity: lights. Broken slats of wood, nailed to the inside of the window frames, signal the long absence of paying guests. It’s a grimy scene of peeling walls, broken drawers, a grungy old bedspread. There is one chair. This is the base of operations for Kate’s hard-nosed, cold-blooded collaborator, Stine (Philip Earl Johnson). He has added a personal touch: heavy slots at the doors where long boards can be dropped to prevent unwanted entry – or exit. 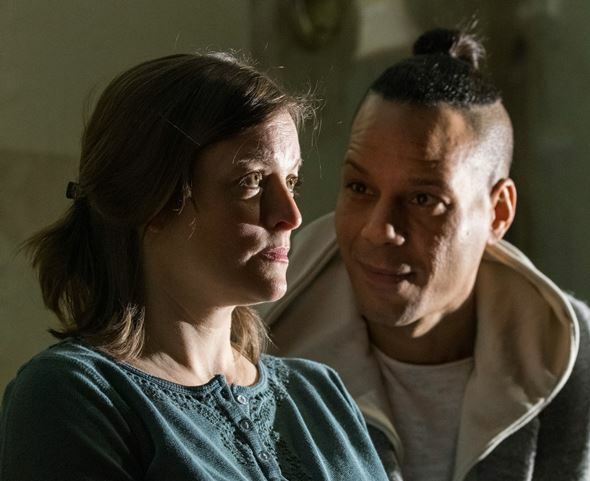 Stine warns Kate (Gwendolyn Whiteside in a performance that mixes rising anxiety with zooming acuity) that what she’s about to endure could get pretty ugly; she will have to trust him, do exactly what she’s told and be prepared not to recognize her transformed daughter. Overcoming the brainwashing of three years’ immersion in the cult is nasty business. Success will depend on Kate’s complete acceptance of Stine’s tested methods, however harsh they may seem. But Stine proves as good as his pledge. To the waiting mother, he brings a girl of about the right age, eyes glazed, babbling about the steps of ascent that will take her to perfection in the view of the cult’s lord and master. There does seem to be some question in Kate’s mind about whether this is in fact her daughter, but the girl (maniacally and slyly rendered by Grace Smith) recognizes several objects Kate has brought in a box, and she knows some intimate details about her mom and dad and what made her childhood home special. Even if not too special to run from. In short time, however, Stine’s high-handed, impulsively brutal style begins to wear on Kate. Johnson cuts a fearsome yet mesmerizing authority figure, knowing just how hard to push before backing off with a hint of understanding and sympathy, then crashing down hard again. Is this guy Stine for real, or is he playing Kate? She can’t seem to be sure. Of course, she wants her daughter back, her real daughter. But is this girl before her the true object of her quest? Could she have changed so much? Stine says this is normal; he gets it from parents all the time. Kate needs to look harder to see the child she loves and who needs her mother now more than ever. Cult de-programmer Stine (Philip Earl Johnson) lays out his firm rules of rescue to Kate (Gwendolyn Whiteside). Ah, I can neither reveal nor lie. Yes, there is a con in progress and money at least appears to be the prize. But what is the con, and who exactly is the mark? It’s a theatrical shell game. Watch for movement. And watch the unbarred door. Someone new is about to enter: one Harris McClain, whom Stine knows. This fresh face (Jon Hudson Odom) belongs to a cool customer, quiet spoken, adroitly evasive, scary. Anyway, Kate is scared, with good reason. I mentioned a chair. Kate is now in it, a hot seat if there ever was one. On that warm note, I think I’m done. Except to admit that I never mastered the fascinating children’s game of winding fingers with string called cat’s cradle. You can end up in quite a tangle. But once you learn it, well, I’m told it’s rather like riding a bike. Even if you don’t practice for a long time, you can pick it right up again. Muscle memory, really. Someone said that. Recently.